It’s strange to be done with story times. 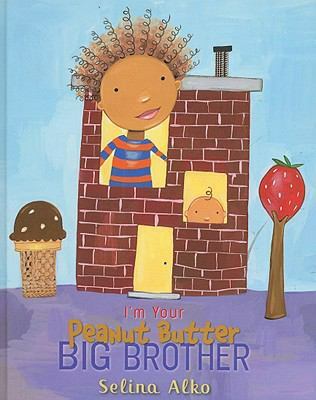 But I’m looking forward to school visits, and I’m excited to get started with summer reading program (SRP) prep! I really enjoyed doing some outreach to a new parents’ support group. The mothers there generally had one new baby and one older sibling, often a toddler, with them. Erica brought many of the elements of her story times to engage the older kids – she read a couple of books and did a song or two. Most of the time was spent talking to the parents about what resources are available at the library for families, how baby story times can help your baby’s development (again illustrated by some activities), and how to navigate the various children’s offerings with two kids of different ages. She had a few helpful handouts, and used a few simple illustrations to talk about brain development. But the most important part (aside from just being there, of course) was giving the parents space to ask questions. How can I read to both of my children at once? What if I can’t return materials on time, or a book is destroyed? What should I do if my child won’t sit quietly through story time? Is it a good idea to raise my child bilingual? Can I do anything to help my child avoid a learning disability? These are just some of the questions Erica might receive at this type of event. Her answers help parents feel more comfortable with the library and the librarian, use the library resources more effectively for their families, and start to understand what they need to do to get their children ready to read. Sometimes, the most important thing withwell-educated, high-achieving parents is to get them to relax – they’re already doing a good job, and they don’t need to obsess over arbitrary “normal” milestones or force reading time on their kids. It’s critical that children develop a positive association with books and reading, Erica stresses – forcing them to read when they don’t want to can sour them on reading for life. After the meeting, we delivered SRP posters and bookmarks to the private schools. Erica doesn’t do classroom visits and booktalks here, but she does provide at least one poster per floor (one per grade or classroom is best) and one bookmark for every student. I was amazed by how many small private schools are clustered around this neighborhood! It’s important not to miss these kids just because they often use their school libraries during the year. They need the public library in the summer, too. I’m looking forward to heading to public schools next week and actually talking to kids! Thursday was mostly an on-desk day – we prepped for the SRP Wall of Fame display, packaged up materials to take to the schools, processed new books, and finished up the paperback order. I found a couple of good websites for new in paperback books, which is great for finding those stand-alone hardbacks just being released in paperback. Series are easier to just track and remember. My favorite website for this was Kidsreads. It was a little slow in terms of reference – I didn’t get a lot of unusual questions. I also had a job interview for a children’s position this week. It felt great to use the things I’ve learned this quarter! I could easily rattle off a list of great children’s materials for all ages and why I like them, could talk at length about early literacy and developmental stages, and had a great arsenal of stories and examples to discuss. I left that interview feeling very confident, both about the interview itself and my ability to do well in the job. Thanks so much, Erica! I was lucky to have a few unique experiences this week. On Monday, I attended the children’s book group. I’ve only been to one before, since it meets once a month. It was great just to experience the dynamic of a group of 10 or so 9-12 year olds. They can be so insightful or thoughtful and so squirmy and inattentive at the same time! But Erica has some nice techniques for bringing them back, as well as keeping them respectful of each other. 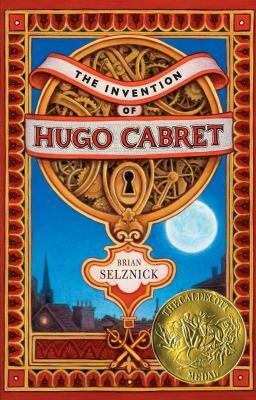 The really unique thing about this particular group was the book, The Invention of Hugo Cabret. The book is almost entirely pictures, and I wasn’t sure how a discussion of a not-quite-graphic-novel would differ from a traditional discussion. Erica did use the pictures heavily – she had the kids talk about the significance of certain pictures, talk pick out their favorites from a series of related images, and consider the meaning of recurring symbols. I thought the discussion was incredibly successful, and the visuals helped some of the squirmier kids focus. This really got me thinking about other kinds of possible discussion groups for kids. What about a group to reflect on popular movies? How about art, music, or other media? Tuesday was preschool story time, themed Things that go Zoom! 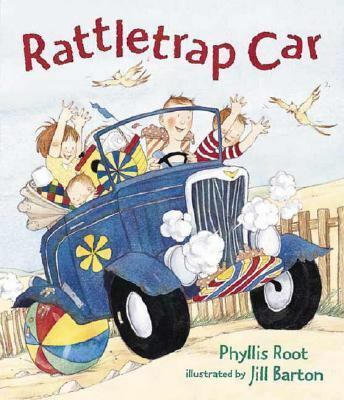 I love, love, LOVED one of the books, Rattletrap Car by Phyllis Root. It’s a very fun rhyme-y story with just the right amount of repetition, it’s funny for kids and parents, and it’s full of FABULOUS sound effects and expressive fonts. It’s excellent for promoting any of the early literacy skills, and it’s fun! I will definitely keep this book in my arsenal. Also, Erica showed me how to do a great craft, a simple boat from folded paper and yarn. It’s easy enough for small hands, has lots of space to decorate, and makes a nice toy. I loved this story time! Wednesday I finally got to observe a pajama story time. (Check out my AWESOME pink teapot PJs!) The crowd was much smaller than a regular ST, which is great – 100 people wouldn’t make for a very relaxing room. But we had about 30, which was perfect. Erica tried to craft the energy of the ST so that the kids got to be active and wear themselves out at first, and then settled down and got ready for bed by the end. Essentially, this meant doing a dance portion in the middle (the fabulous Justin Roberts’ Silly Dance Contest), and saving the quietest story and song for the end. The wind-down wasn’t quite as successful this time as it sounds like it was last month – the kids were just energetic all the way through, despite having that built-in arc. I guess there’s only so much you can do on that front. The upside to more-awake kids was that they did stick around to do the craft (just a night sky coloring page). We got a really positive response – parents loved this program – and it’s a fun spin on a vital service we already provide. Plus, wearing your PJs at work is a great way to get attention for a program! Thursday I missed half a day for my SPL CRP interview (fingers crossed) where I got to present the materials from my story times last week. After, I went to the children’s services meeting. Going to these large meetings has been fantastic. It drives home the advantages and disadvantages of working in a large urban system. On one hand, it can be difficult to make and implement system-wide decisions and changes. On the other hand, it’s wonderful to have such a great group of colleagues with whom to share ideas, skills, resources and opportunities. I’m consistently impressed with how well the groups cope with uncertainty and change, despite the challenges. Those with concerns are able to make their voices heard in a respectful and supportive environment. And it’s great to learn new story time techniques, to hear others’ review of new materials, and share expertise gained at conferences and trainings. It’s also been wonderful to meet so many of the librarians in the system. I’m really grateful that Erica and Jessi have let me tag along. As a crunchy eco-maniacal psuedo-hippie, I couldn’t resist doing a gardening theme. I described the general plan in last week’s post, so this week I’ll focus mostly on how they went. I did one preschool story time (2-3 books, song, dramatization, craft), two toddler story times (2 books, song, no dramatization or craft), and a family story time (basically set up like preschool story time). Erica does four every week, so it was good experience to learn how that feels. It definitely takes a lot of energy! At my first story time, preschool, I found that I was going to be done ahead of time. I wasn’t nervous and reading too quickly, so I wasn’t sure at first exactly why my story time went so much more quickly. I had a third short book on hand just in case, so I went ahead and read that one also. The craft was a huge hit – although everybody was so excited to plant their seeds that they skipped decorating their cups entirely. Afterward, Erica told me that the timing issue was because she often goes through her song and dramatization a couple of times, but I had only done each one once through. I remedied this in my later story times, and they stayed on track. The toddler story times both went well, but they were interesting in how different they were. The first session was larger – about 95 people, while the second had only 75 – and also included a preschool. It’s a little hard for me to gauge how successful a story or activity is in this situation, because at any given time there are lots of kids who are distracted. That’s ok – they’re not expected to be on task the entire time – but it’s a bit difficult for me to tell the difference between normal distraction and actual disinterest. Erica said they were rowdier than usual, but that she didn’t think it was problematic. The second toddler story time felt much smaller, even though it wasn’t, perhaps because of the higher adult-child ratio. I definitely felt more in control of the room, and that I could bring attention back with a question (do you think that her mom liked the gift?) or a short interaction (let’s make butterfly hands!). Also, I realized I hadn’t been thinking much at all about the big book. I feel very natural handling them now – I don’t have to think about it any more. Success! In this story time, I had trouble with the transitions between elements. In the busier story times, I was busy trying to call back everybody’s attention for the new activity. In this one, they just sat silently and waited for the next thing. Erica said it’s a good idea to establish a routine that signals “ok, this is over”, like applauding their listening skills. This was a difference between large and small groups that I hadn’t anticipated, so in the future I’ll have to plan accordingly depending on the probable size of my audience. Through each story time, Erica gave me feedback on small improvements, like places I could add an interaction or a better way to phrase something. These were really helpful. If I’m doing story times professionally, I will definitely want to practice them on a real person – another librarian or even just a friend – and get their ideas. I had a great time this week! I’m looking forward to observing some more story times as well – I think I’ll get more out of those experiences now that I’ve done a few myself. The two big projects of this week were attending a teen services meeting and preparing for my story times next week. I’ve decided to do a gardening theme for my story times. I’ll read Eve Bunting’s Flower Garden for each of them – Erica has a nice big book, and it’s appropriate as the harder book for the toddlers and the easier one for the preschoolers. I’ve placed holds on a few books, so we’ll see what comes in before I choose the second book for each group. We’ll also sing a song to the tune of “here we go round the mulberry bush”, with words like “This is the way we (dig a hole, plant a seed, bury the seed, water the plant, smell the flower…), all around the garden”. The preschoolers will do a craft, the inspiration for which came from www.thebestkidsbooksite.com. We’ll decorate paper cups, then use them as pots to plant pea seeds. We’ll also do a dramatization, being seeds and growing. Erica’s hilarious and brilliant idea: bring a spray bottle for when it “rains”! I’m also really grateful that Jessi brought me to the teen services meeting with her. It had a very different vibe, and very different goals, from the children’s meeting I attended a few weeks ago. Erica S started out the meeting by distributing Play-doh, pipe cleaners, and stickers! She said having something to do with their hands would help people stay engaged through the long meeting. I love this idea, and I will definitely want to adopt it if I’m ever running meetings. What I liked most about the meeting was its focus on building connections rather than disseminating information. While we did have announcements and speakers, a lot of time was spent asking for and offering advice on a variety of services and materials. The discussion made space for everybody to share, forming a nice sense of community and made each person feel like her opinion was valued. Since most of the teen librarians will rarely if ever work together, this is a very important way to make sure they’re able to use each other as resources to improve service across the system. A busy return after being away last week! I read at toddler story time, observed baby story time, put up a children’s display, assembled a book list, and spent time on the reference desk. 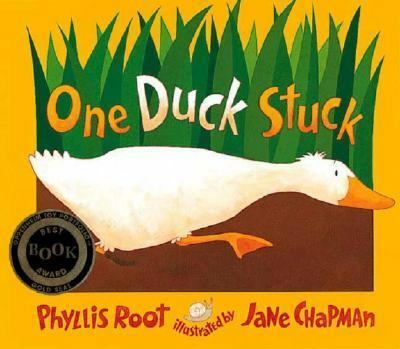 Erica’s story time theme this week was ducks, and she had a big book of One Duck Stuck. Since I’ve been having a little trouble handling big books, I tried reading this one at both toddler story times on Thursday. I’m really glad I got to do this twice in a row, because it went much more smoothly the second time. I was able to concentrate less on turning the pages without ripping the book in half, and more on telling the story. Also, it was just a bit long for the first group’s attention span, so I clipped some pages together for the second reading and the kids stayed engaged. I’m looking forward to running a whole story time next week! I also spent a lot of time this week on the new seasonal children’s display. The children’s section doesn’t have much space for a display of books, so Erica uses a cork board to put up pictorial displays. Mine is for spring and early summer, so I’ve themed it “Grow! Read!” I made large paper flowers with covers of children’s books with spring and summer themes as the centers. I had a lot of fun, and Erica gave me enough time to make it very elaborate. Of course, I would never have that kind of dedicated time as a full-time children’s librarian. However, I could have made and assembled most of the pieces while on desk to save time. I also just browsed the shelves nearby, and found a few other selections. I picked a few on adopted sibs this way as well. I hadn’t thought of that while at the computer, but of course many new babies coming home are adopted. One more reason to always go to the shelf! Finally, I observed baby story time again this month. Since this was totally new to me last time, it was nice to see it again and be able to soak up more of the details. I got to think about what types of activities and props might be effective, and observe the balance of time between reading, singing, and other activities. 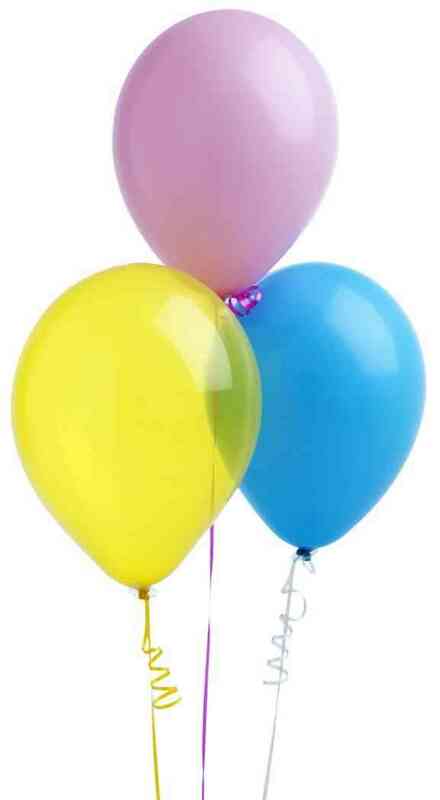 Erica used balloons to demonstrate play and learning, which was very successful and fun for adults and babies. However, I think I would be too nervous about the choking hazard if any of them popped to replicate this on my own. Next week I’ll start off by heading to a regional teen services meeting. This week, Erica was on vacation. However, that didn’t stop it from being pretty action-packed. My plan was to visit the Northeast story times on Tuesday (Chrissy) and Thursday (Marion), and attend a few others at different branches during the rest of the week. On Tuesday, I came in as scheduled. However, Chrissy called in sick. I didn’t want to disappoint the kids by canceling story time, so I volunteered to do it. Thankfully, the room was already set up! I had half an hour to put together a story time, so it was a bit of trial by fire. Chrissy had planned to do a chicken story time, and we’d prepared a chicken craft and found a chicken hand stamp. However, I wasn’t sure I could find several really good chicken books of the right length and difficulty on short notice. But I could think of several farm animal books. I pulled one from the shelves, “Hen Hears Gossip,” and used Erica’s big book of “The Big Red Barn”. The I pulled a few others to set out for parents to check out. For our song, I found an Old MacDonald felt board set. This was the newest thing for me – I do regular kindergarten story times for Page Ahead, but I’ve never used a felt board. I thought this would be a great chance to use some of what I’ve learned from Erica and give it a try. Overall, I think it went fairly well. Hen Hears Gossip didn’t garner as much enthusiasm. I think the joke – that each animal hears the gossip in a slightly different way, and repeats the wrong thing – was a little too sophisticated for many of the children, although the parents got a kick out of it. The Big Red Barn was familiar to many of the kids, so they loved that. I basically just followed Erica’s outline, so the story time practically ran itself. Most of the books I set out got checked out and played with, also, so that was nice. And the craft was very popular. I discovered that it’s very difficult to manage a big book, especially towards the end; I’ll have to ask Erica for advice on how to hold it and turn the pages. I observed Joanna at Green Lake and Marion at Northeast as well. They had very different styles from each other and from Erica, so that was great. Green Lake gets a much smaller crowd, so Joanna was able to use musical instruments and shaker eggs. This was a lot of fun! Rather than doing something structured with them, she just put on a CD related to the theme and let kids play and dance. I thought this was a nice release valve. Also, Joanna was doing a family story time, which I hadn’t observed before. Something less structured allows children of all ages to be involved, and gives parents with infants a chance to soothe the baby while the older child is distracted. She also tried to have a little something for each age group. She started out with a pop-up book for the younger children, and transitioned into more difficult books later. Also, instead of a felt board she used a velcro glove with little puppets. I hadn’t seen that before, but it’s cute. Observing Marion was interesting because it was in the same space with the same kids I normally see. That made it very easy to see how small differences can have a big effect. One little thing Marion did that I absolutely loved was to move her chair closer to the rug. It really added to the sense of intimacy, even though her story times were both very large (75-95 people). Like Erica, she wrote a letter on the board. However, she wrote both the upper and lower case. This is a very small change, but I thought it could make a big difference in how kids learn to recognize letters. Also, I really liked how Marion handled the book. One thing I noticed at both story times is how difficult it is to change the children’s routine. Joanna tried to sing along with the book “Old MacDonald had a tractor,” but it was very difficult to get the kids to adapt to the new pattern. Marion used a slightly different version of the song “open, shut them” than Erica, and the kids essentially just refused to do it. They sang their regular tune and words until Marion changed her version to match theirs. I can see the importance of having a routine for young children, but I also want to make sure in my own story times that I expose them to new things. I realize that I’ll have to be very deliberate and up-front about changing any established pattern, or it will be difficult for the children to accept the new idea. Unfortunately I wasn’t able to make it to as many story times as I would have liked due to scheduling conflicts, but I’d like to continue visiting other story times throughout the quarter. I especially would like to attend a bilingual story time. Marion also suggested trying out King County story times, to compare their styles. This week I also attended the regional children’s librarian meeting. It was fascinating to see how the regional system is working out. In many ways, it seems to be very effective. The librarians from many branches have worked together to make sure story times are offered on a variety of days, at different times, and that all age groups are adequately covered. Even though budgets have been cut and there are fewer available children’s librarians, program coverage actually feels like it’s increased. It’s wonderful to encourage everybody to work together this way. Also, the librarians shared their thoughts, concerns, and resources with each other. I wonder if communication between them was this good before the region was established. However, the regional system also has its problems. Some neighborhoods and schools are receiving less time and attention, and covering for them with librarians from other branches puts a strain on everybody and wastes time in transit. The librarians are not each assigned an equal load; some are leading many programs while others have almost none. Seeing how these issues are addressed has definitely informed the way I think about distribution of time and resources throughout a system. Next week is the children’s book group, which I’m very excited to attend! I’m starting to fall into the rhythm of story times and desk shifts. It was nice to see each age group’s story time for the second time around. Some of the kids and families recognize me, and I’m absorbing more of the details of how Erica delivers an effective story time instead of just paying attention to the big outline of what she does. Her story times have a great rhythm – they flow nicely between stories and activities, and don’t get derailed when a few children get fussy or overeager. I’m not sure that there’s one particular secret to having this kind of gentle authority – I guess it comes with experience – but hopefully watching how Erica deals with individual situations will help me get a sense of the larger skill. Also, this week I began a weeding project in the children’s folk and fairy tale section. Most of the nonfiction at Northeast underwent a significant weed last year, so there’s not much to do beyond pulling damaged items. We did a dusty shelf on the easy nonfiction, and found that almost every item was circulating (or missing). Folk and fairy tales, however, had a more substantial group of poorly circulating items. We speculated as to why this might be. They’re not in a very visible location, and their Dewey classification is confusing for browsers. Using the Horizon tools for weeding was a nice way to learn more of the technology, and also to see how other branches are dealing with this collection. It looks like a few of them need to weed their folk and fairy tales, too! books, worked on the book order, and set up a basket of craft materials for Erica’s sub next week. 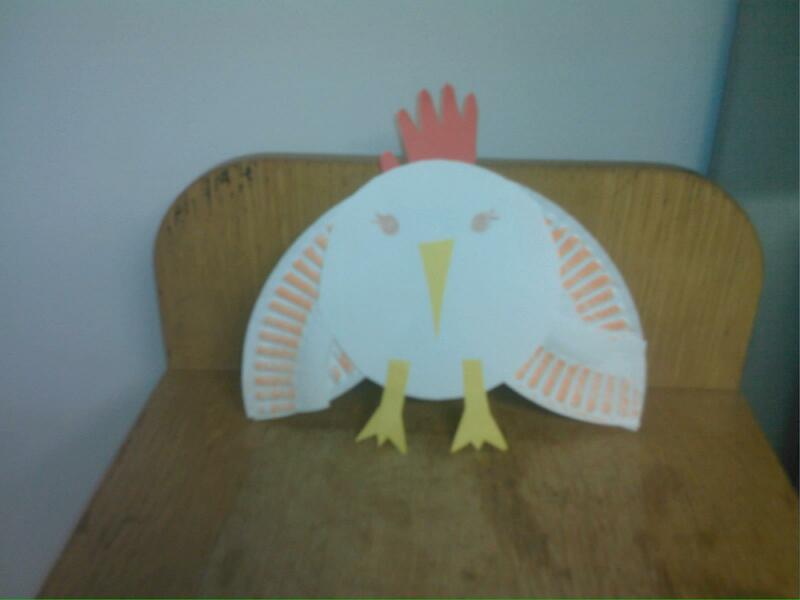 (I made this craft sample for her chicken-themed story time.) It’s also important for her coworkers. Erica is much more program-heavy than they are, which means she’s available for desk shifts far less often. That puts a lot of burden on them to be on desk, and cuts into the time they have to plan their own programs, maintain their collections, etc. It’s a difficult balancing act when one person does much more programming than the others – but it will probably be the case in almost every library that the children’s librarian is doing far more of this than anybody else. It’s good to see how everybody works with this. A day without story time also gave me more time on the reference desk. I’m getting to help with a wide array of adult reference questions, from finding an old photograph of an amusement park ride which no longer exists to printing a list of regulations for decommissioning oil tanks. And, of course, I’ve received many tax-form questions. I still wish I could find these answers more quickly, but I have felt that everybody has walked away with good, useful information. Observing and assisting the other librarians has been a great way to learn more about the resources the library has to deal with these inquiries. I’ve also discovered that I have much stronger teen RA skills than I had realized. Just from reading some teen lit, writing a few reviews, and spending time in the teen collection at Sno-Isle last quarter, I’ve apparently picked up a pretty solid working knowledge of teen materials. Realizing this makes me want to ensure that I do the same for children’s this quarter. 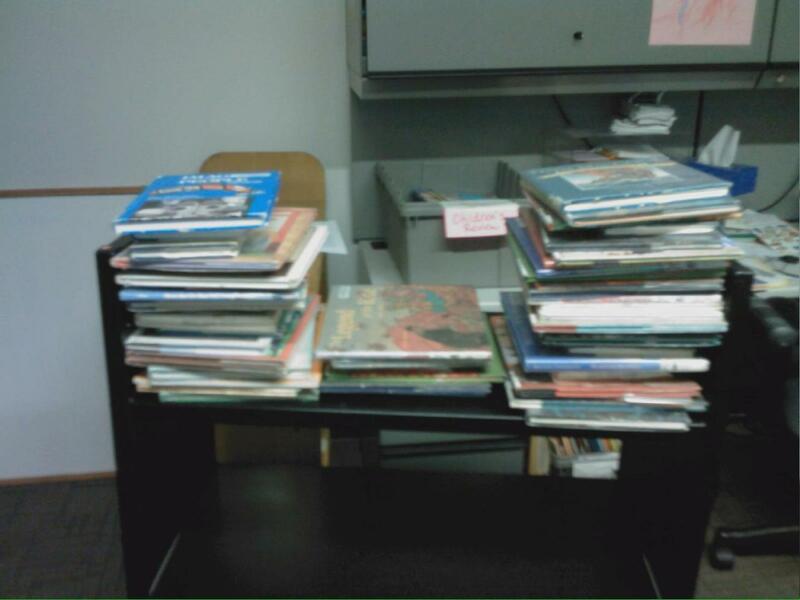 I’m making an effort to read more children’s lit, and to pay attention what is being weeded, ordered, and processed. Next week Erica is on vacation, so I’ll be bouncing around to visit some other story times.